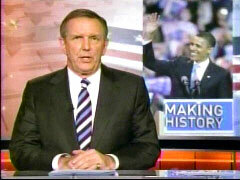 Anchors w/ Obama 'Not Like North Korean TV Covering Kim Jong Il' Really? Will Katie Couric be as tough with Barack Obama as North Korean television is with Kim Jong Il? The last time Couric (and the other anchors to, for that matter) interviewed Obama the liberal Democrat had no more to fear from her and them than the communist dictator ever has from his state media. Yet, when Couric last sat down with Obama, back on June 4 when he had become the presumptive nominee, Couric was so giddy she couldn't complete her question: “Did you ever think you'd see this day? I mean, are you still just completely-” Pressing Obama about picking Hillary Clinton as his VP consumed five of her seven questions aired in the CBS Evening News excerpt. The ABC, CBS and NBC evening newscasts all led Wednesday night with celebratory interviews with Democratic presidential nominee Barack Obama -- with ABC and NBC plastering "MAKING HISTORY" on screen -- as the three anchors luxuriated in Obama's success. ABC's Charles Gibson wondered: "I'm curious about your feelings last night. It was an historic moment. Has it sunk in yet?" Gibson followed up by prompting Obama to share his excitement: "When everybody clears out, the staff is gone, you're in the hotel room at night, and you're alone, do you say to yourself, 'Son of a gun, I've done this?'" On CBS, Katie Couric was so giddy she couldn't complete her question: "Did you ever think you'd see this day? I mean, are you still just completely-"
"And your wife came up on stage with you last night, and in an otherwise private moment, attempted to give her husband a fist pound the way a lot of Americans do, the way a lot of couples do. Only problem was, it was an inside move shared in front of seventeen and a half thousand people in the arena and millions watching at home. It's the most talked about fist pound on the Internet today, you'll be happy to know." All three pressed Obama about picking Hillary Clinton as his running mate, with Couric the most aggressive. The topic consumed five of her seven questions aired in the Evening News excerpt, starting with her stroll through history: "In our latest poll, 59 percent of Democratic primary voters, including 46 percent of your voters, think you should select Senator. Clinton to be your running mate. So, in the spirit of Kennedy picking Johnson, and Reagan choosing Bush, why not pick Sen. Clinton? And please don't tell me it's premature to ask that question." No doubt Couric, Gibson and Williams will be tougher this coming week if only to show they are not totally in the tank for Obama.